ok, so you need to get all the latests ( vuforia, unity 2018 and the bridge from the ecosystem), and simply delete the offending file. I just tested, and it works, if I add the PLAYMAKER_VUFORIA_7_2_20_OR_NEWER compile command. But you really can just delete the offending script and be done with it. I have the same problems with Unity 2018.2.14f1. All is fine, but when i install the playmaker vuforia package from the ecobrowser, i'm running into trouble. You said, you have updated the package on the ecobrowser. You mean the Unity 2017 package or is there another one which i can't see at the moment? In the ecobrowser i can only find Playmaker Vuforia Package for Unity5 and Vuforia Package for Unity2017. Please redownload the vufopria package ( 2017) from the Ecosystem, I fixed the editor system to detect the version, it will be easier for 2018 and newer versions of vuforia. it worked a while, but now we have the same problems again. Why it worked for a while remains a mystery to us, we have not changed anything in the project. The Vuforia package does not seem to be running smoothly yet. Unity 2018.2.14 with current Vuforia and latest Playmaker Vuforia Package (2017) from the Ecosystem. We also tried all suggested solutions several times including the compile command PLAYMAKER_VUFORIA_7_2_20_OR_NEWER and also the deletion of the relevant scripts VuforiaSetPersistExtendedTracking and VuforiaGetExtendedTracking. Need urgent help, we have a current project which depends on the Playmaker / Vuforia connection. uhm... it's unlikely that things get out of control without something happenning inside your project. -- do you work in team, maybe someone touched something? -- simply delete the offending file, it's an obsolete action anyway. If you delete the VuforiaGetExtendedTracking, what error do you get next? 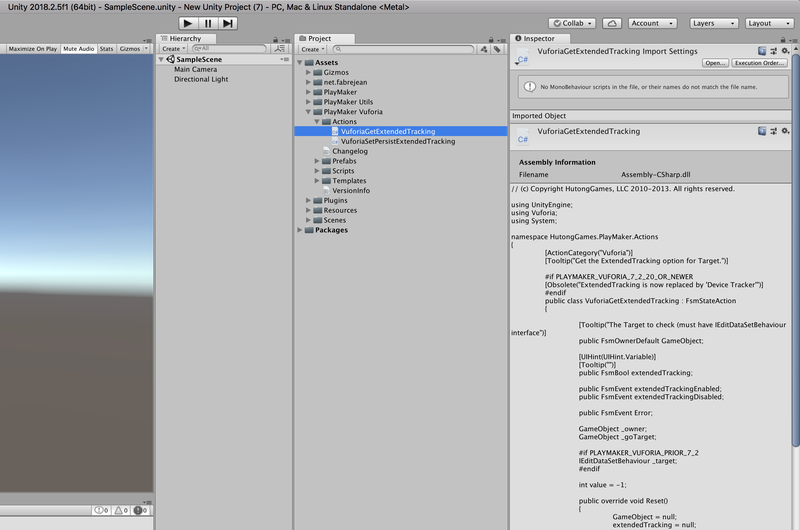 If it mention the same file, Unity needs a bump to refresh its asset database. Currently it seems to work, have played through all the solutions again. I am currently working on the project alone and the autocompile mode is also activated. The only thing I have changed on the already without problems running project (I could even generate a bugfrieen build! ), I have disabled the preview play mode of Vuforia in the inspector, since I currently have no webcam here in use to test. When I ran the scene in play mode, all the problems returned immediately. With problems I mean actually only the two scripts, VuforiaSetPersistExtendedTracking.cs and VuforiaGetExtendedTracking.cs. As soon as I delete one of the two as proposed, new error messages will be added. The error messages in the exact wording. Assets / PlayMaker Vuforia / Actions / VuforiaSetPersistExtendedTracking.cs (29,13): error CS1061: Type `Vuforia.ObjectTracker 'does not contain a definition for` PersistExtendedTracking' and no extension method `PersistExtendedTracking 'of` Vuforia.ObjectTracker' could be found. Are you missing an assembly reference? Assets / PlayMaker Vuforia / Actions / VuforiaGetExtendedTracking.cs (34,3): error CS0246: The type or namespace name `IEditDataSetBehaviour 'could not be found. Are you missing an assembly reference? Nevertheless it seems to work and I can build a working build. It should also be mentioned that up to and including Unity 2017.4 I never had any problems with your Vuforia Package (2017), it was always great and was set up quickly! Only when changing to Unity 2018 the problems started. yes I know, I always use the playmaker Vuforia Packackge (Unity 2017). However, it looks like the Ecobrowser always downloads both packages directly as soon as I just want to install the Unity2017 variant. Could that possibly cause problems? See also the attached screenshot from the Ecobrowser, only the Unity 2017 package by itself I can not install, it always directly both packages are installed. Anyway, currently it is running despite the error messages and I can also create builds without errors. It's odd, cause here I can't reproduce this, so there is likely a problem of communication. Can you try a fresh project? ok, that's because you are using this action in your fsm, that's already not an issue with the packaging. I just triple checked again. it's working now, completly without errors. My problem was that there was an old template in the vuforia playmaker package (not created by me). See the attached screen. After deleting this template all works fine! Thanks a lot for your help and for the quick responses!